The first morning I fixed these little gems. They were pretty darn delicious. My kids argued that they are NOT scones but biscuits. 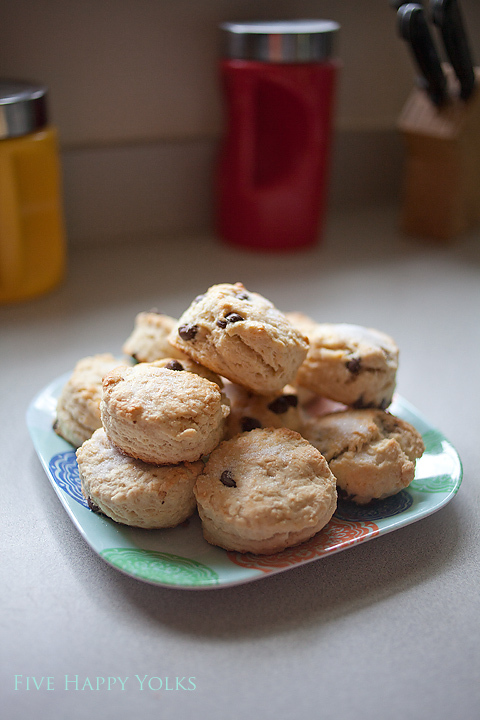 Well, I cut them like biscuits, but they ARE scones and they are easy and delicious! Heat oven to 400*. Cover a baking sheet with parchment paper or spray with non stick cooking spray. Whisk together your dry ingredients. Cut your butter in with a pastry blender or a fork. Add cream and vanilla, mix well. Once dough starts to form you may need to use your hands, I did and I had to add in about 2 Tbsp more liquid to get it all incorporated, so use your own judgement here. Add chocolate chips and mix well. Lay out on flour covered surface, you can roll it out or press out with your hands (I pressed) take a biscuit cutter and cut out your scones. You could also, at this point after pressing, cut into triangles. Either works beautifully. Place on baking sheet, brush with cream and bake for 12-14 minutes. Once done, sprinkle the tops with sugar immediately upon them coming out of the oven. Serve warm with butter. They also freeze well, I froze half of the batch and my kids had them this morning. Just takes a bit more on the baking side.